Salvia apiana ‘White Sage’ (pictured right) is grown mainly for its foliage, silvery grey it is a standout as a foliage plant and is also known as the ‘sacred sage’. Can grown from seeds although germination may be a little tricky for the novice. S.apiana will reach around 1 m and has attractive white to pink flowers inspring. Originally from North America this is drought tolerant and requires little care, although in hotter areas if given some protection from the extremes of the afternoon sun it will perform a little better. Try pinching back regularly to maintain a compact bushy habit. 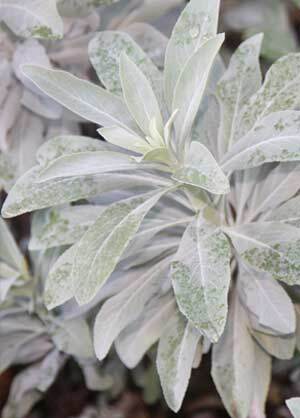 Makes a wonderful accent plant in the garden border where its foliage can act as a foil for other plants. A mound forming species try plant in groups of five or six Salvia apiana in a group for a stunning effect. Although this is a tough and hardy plant we suggest digging in some well rotted compost and manure before planting, water in well with some liquid seaweed fertilizer. Keep light pruning at regular intervals to maintain that bush mounded shape. Salvia apiana looks great in the cottage garden.